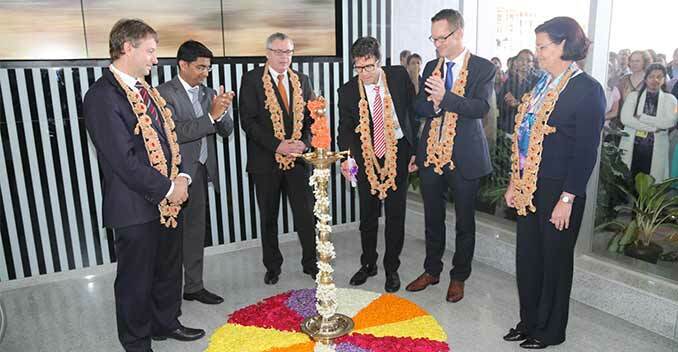 Mercedes-Benz Research and Development India (MBRDI) has inaugurated its second dedicated facility at Whitefield, Bangalore. Spread across an area of 266,000 sq.ft. with a capacity of over 2,400 people, it is located close to Whitefield Palms which is home to the head office of MBRDI. Thomas Merker, Vice President Body, Safety, Telematics Mercedes-Benz Cars Development and acting Chairman MBRDI said, "MBRDI plays an important role within our global research and development organization and this new facility is another milestone in the growth story of Mercedes-Benz R&D in India. With currently over 2,000 talented engineers and close to 200 patents filed for innovation in automotive development - MBRDI is a success story." He added, "Our growth strategy focuses on harnessing local capabilities and Bangalore with its large talent pool is the right location for MBRDI. The new facility offers best in class infrastructure and its proximity to Whitefield Palms, the head office of MBRDI, ensures that there is excellent functional collaboration and therefore shorter development cycles. We are excited about our growth and what we offer here at MBRDI."